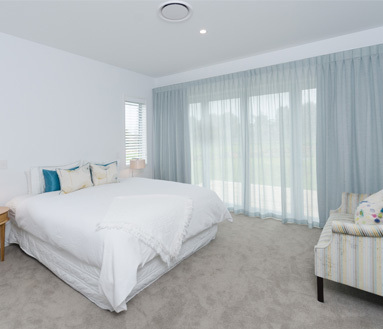 Penny helped design the beautiful tranquil master bedroom. Wooden blinds either side of the bed help direct or block the light into the room. 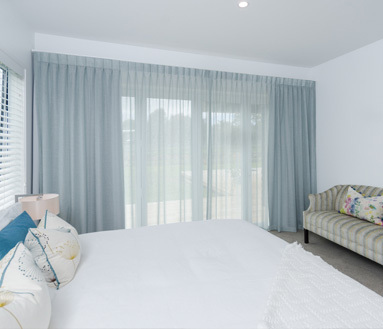 The clean crisp lines are softened by voiles over dove grey curtains, to create a very gentle diffused light. 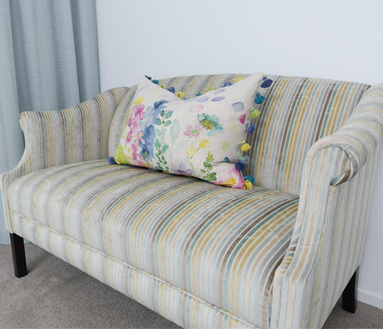 The striped fabric that we used to reupholster the chaise lounge adds subtle infusion of colour and the floral cushion with pom-pom edging provides a feminine flourish. 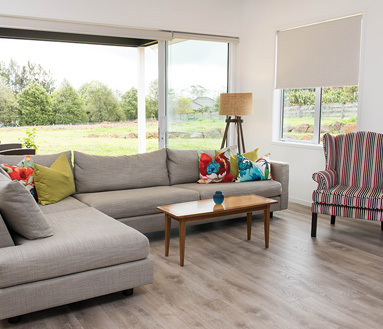 Putting a lunge suite in this generously proportioned room provides a nice quite place to reflect on life, away from the hustle and bustle of family areas. The sense of luxury is reinforced with a long pile carpet which is just delicious underfoot. This vinyl flooring provides an elegant, yet practical covering to high traffic areas with heavy indoor/outdoor flow. It’s light, airy and easy to clean! 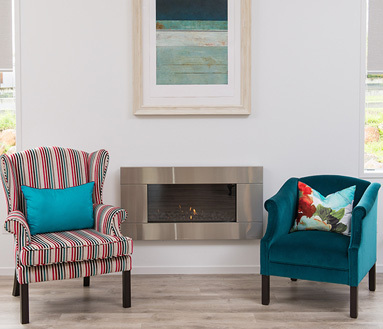 The arm chairs were treasured family pieces and have been given a new lease of life by upholstering in bright contrasting colours. 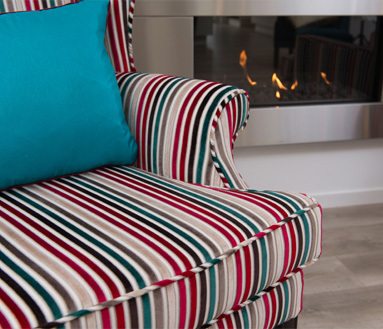 We supplied the extra-large lounge suit which was custom made to fit the room and the colourful scatter of cushions which picks up the colours from the arm chairs. The full block out roller blinds were the most practical, fuss- free choice when all the pushback joinery is open and they work well with the clean lines of the house.